British chick-lit bestseller hits all the right marketing buttons. 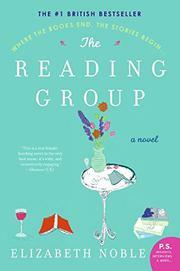 Uplifting, interconnected stories of women in a reading club overcoming crises? Check. Twelve months’ worth of mini book reviews? Check. And first-novelist Noble packages it so neatly, outlining the books and characters for reference before her story even begins. Harriet and Nicole are stay-at-home moms in their 30s whose husbands work “in the City.” Harriet doubts she still loves sweet, upright Tim; Nicole loves philandering Gavin too much. Polly and Susan are a decade older. Polly, a divorced paralegal with a teenaged son and a college-aged daughter, has just accepted a marriage proposal from dashing lawyer Jack. Susan runs a soft-goods business; she and perfect husband Roger, a doctor, are dealing with her beloved mother’s suddenly failing health. The club’s fifth and most expendable member is Claire, the deeply depressed daughter of Susan’s employee. A midwife who can’t have children, Claire has withdrawn from long-suffering husband Elliot. Each month’s chapter begins with a club meeting at which lightweight intellectual discussion takes place (hot for Heartburn, cool to Atonement), then follows the women’s evolving situations. Harriet pulls back from the brink of adultery and wakes up to her real love for Tim once he threatens to walk. Catching Gavin in the act, Nicole finally finds the gumption to throw him out. When Polly’s daughter Cressida announces that she’s pregnant and doesn’t want to marry the father, Polly decides to keep the child for her so that Cressida can finish her education. Jack balks at first, but the baby’s charms win him over. Their mother’s death brings together Susan and her bitter, long-absent older sister after they realize that Susan was actually adopted. Shocked to learn that Elliot is the father of Cressida’s child, Claire finds her calling as a nurse in Romania. Bound to be a hit, but depressingly adept at perfecting the formula.